Toupees, Spiders And Brains Dancing - Not All In One Literary Festival! Tuesday is here and before I nip out to my other job, I want to bring you up to date on a few things happening in the world. First of all, this might not be a music festival but there is certainly every reason to visit the 21st Hay-On-Wye Guardian literary festival this year. Set in the picturesque tiny town of Hay-On-Wye located on the border between England and Wales in the UK, this literary festival attracts some 80,000 people annually and this year I'm sure will be no exception. The 2008 line up includes Alan Bennett (whose works include The History Boys, which won six Tony awards on Broadway; The Madness of King George for which he was nominated for an Oscar; and a Question of Attribution for which he won a BAFTA award), John Irving (author of The World According to Garp, The Cider House Rules and Setting Free The Bears), Will Self, playwright, director and scriptwriter Stephen Poliakoff, Salman Rushdie, author and broadcaster Melvyn Bragg, US author and journalist Carl Bernstein (who along with Bob Woodward helped break the Watergate scandal story and ended the Nixon US administration in 1974), comedians Jimmy Carr, Marcus Brigstock, Omid Djalili and Rory McGrath, Jools Holland, Charlie Higson, chess champion Garry Kasparov and the former US President Jimmy Carter. Mr Carter, president between 1977 and 1980, will discuss the Middle East at the 21st literary event. Meanwhile, Cherie Booth, the wife of former Prime Minister Tony Blair, will speak about women's equality. Other guests include chef Jamie Oliver, M&S boss Stuart Rose and former head of the Army General Sir Mike Jackson. This Welsh festival, which runs from 22 May until 1 June, now has satellite events in Segovia in Spain and Cartagena in Colombia. My last experience of Hay-On-Wye involved camping near the centre in a friend of my room mate at uni's father's field. It's is a really relaxing place with loads of bookshops (that's is pretty much all there is) and tables covered in books left out for passers by to take books and leave the money they think appropriate for the books they take-now that's a pretty rare sight in this world hey! It's the place to go if you have a rare book you want checked out or if you are looking for that out of print book no one else has heard of. Basically Hay-On-Wye live and breathes books. One for the diary? Beware, hotels will be booked up and finding a place to stay won't be easy with the time left but it's still worth a try. If you're interested in the full line up, click here for a brochure. "I really enjoy his music and have had a great appreciation of him as an activist for peace and justice." Apparently Young isn't the first musician to have a creature named after him. A species of beetle that looks as if it is wearing a tuxedo, the whirligig beetle, or Orectochilus orbisonorum, was named earlier this year after the late rock 'n' roll legend Roy Orbison and his widow Barbara. I think this a really cool idea and hope there will be more to follow. It could make for some great new cocktail names (can't think of any right now). It might also baffle historians some 500 years from now when our databases have all been corrupted and we can no longer access data recorded now and they try to figure out where the spider got it's name from. Maybe that's pushing it a bit too far. One other bit of news which is probably only understood by a British audience aged 30 and above -remember the comedian Frankie Howerd? Titerly not! 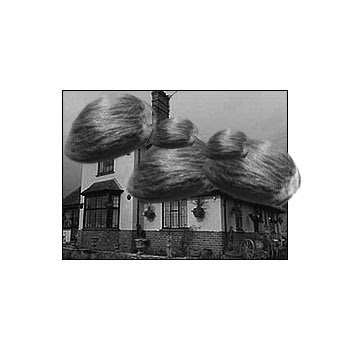 Well his house has just gone on sale with thousands of items of memorabilia, including his toupee, available as optional extras. The house is reported to have an uniquely thatched roof, much like Elton Johns head. Oh and one last thing, remember the song 'Rhythm Is A Dancer' by Snap back in 1992? Well it's being used in the latest ad for Drench Spring Water. See Brains from Thunderbirds strut his stuff in a way I've never seen him do it before! I think he looks scarily like the lead singer from Hot Chip, Alexis Taylor. Apparently PuppetCraft created and operated a Brains puppet for the filming with CGI used in post production. It's quite impressive and certainly got me watching. Not sure even John Malkovich could operate his puppets this well. 'I'm as serious as cancer when I say rhythm is a dancer'. Couldn't they have come up with any other word to rhyme with dancer?